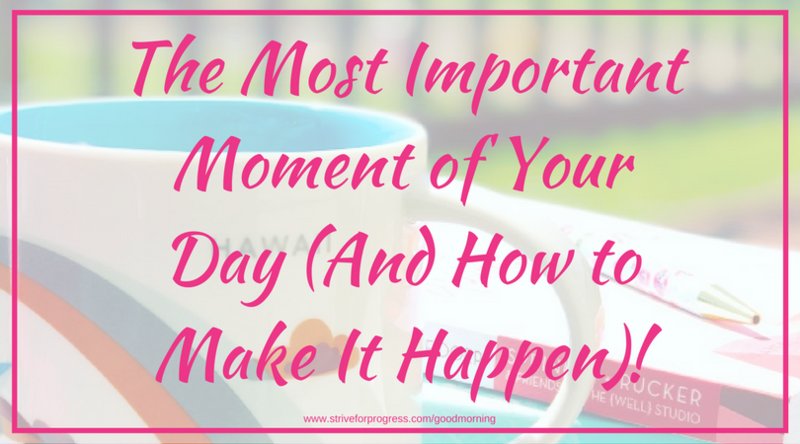 The Most Important Moment of Your Day (And How to Make It Happen)! It’s a good, GOOD morning to rise, shine and be a light for Christ all day long! Do your eyes pop open early in the morning and you find yourself feeling refreshed and ready to take on your day? Or do you enjoy getting a little extra sleep and stay in bed as long as possible? Maybe you don’t have a choice right now. It all depends on what time your kids jump on your bed or ask for a hug during your morning quiet time. Whatever the case is, as a Mom of three girls, I have experienced different seasons of morning wake up times. My wake up times have ranged between 4:30 am to 8:30 am since 2003. For the last couple of years, it’s been around 7-7:30. Lately, I’ve had it on my heart to be getting up at 5:00 am, and I’ve been praying for God to help me get up then. I really enjoy five because of the two hours of quiet before the kids get up. Getting up early gives you a huge extra time bonus for your day! Plus it gives you extra time with God. Mornings are obviously important to God. If you go search Bible Gateway you’ll see at least 210 instances of Morning. ”Early in the morning…” a lot of people like Abraham, Jacob, Moses, Ester and more got up or went somewhere! Mornings are a big deal! And whether you get up at 4 am or 8 am it’s important to take a few minutes to pray, read and journal. So whatever season of wake up times you are in I urge you to wake up 15-30 mins earlier and spend precious time with your creator. Think about this, you are waking up to spend time with God Almighty. The one who directs your life controls the universe and, oh yeah, MADE YOU! Tell God thank you, ask him for help and ask him to guide your day. There will be mornings you wake up late, the alarm didn’t go off, or you got up had a peaceful morning until drama between your kids starts up, it will happen because Satan hates mornings. The enemy hates light, and when you get up with the morning light and fill yourself with the SON light you are fighting the enemy back. 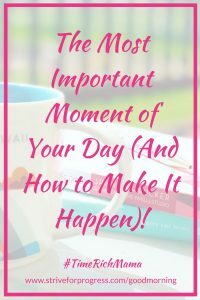 Here is my current morning routine in case you need some inspiration! 5:00 am Wake, wash face, dress for my workout, drink lemon water. 5:20ish Find a quiet comfy spot (outside on my deck in the summer, inside on a couch when it’s cold). Read, journal, pray, plan and drink coffee. 6:15 am Do some chores, eat breakfast, talk with hubby. 8:00 am Family devotion, help kids get ready for school, chores. 8:45-9:30 am Get kids out the door to Nana’s house for school. 10:15 am Work till lunch! And here is a great song to wake you up if you need that! Ready to commit to mornings? Tell me in the comments below. Believe it or not, I committed to early mornings on a blog comment and after I made that commitment I’ve been up early ever since! You can too! Tell me you are committing now so I can pray for you!